Walls keep people out. They lock people in, too. I caught a bus from Beijing to the highway bus stop closest to Jinshanling, and walked my way in along an empty, freshly paved road. Jinshanling is a famed section of the wall about 200 kilometers northeast of Beijing. It was a glorious day: cool and brisk, with the sun shining. I had my gear, and endeavoured to stay overnight somewhere near the wall to capitalise on the emptiness of the early mornings. But when I got to within sight of Jinshanling, the tiny little village near the wall’s entrance...no one was there. It was 2pm or so. After finding a room, I bought a ticket and strolled on in to find a wall vacant of tourists. I was utterly stunned. Jinshanling isn’t the most visited part of the wall. But it’s not that far off the beaten path. Tour groups should be teeming on a day like this, I thought. It was remarkable. Going in to the wall with zero expectations, I was pleasantly and overwhelmingly taken aback by its scale, the scenery surrounding it, and the sheer solitude it provided. I spent that first afternoon walking as far as I could, taking countless photos and time lapses of the rolling clouds. The afternoon sun cast a sepia tone on the hills. It was a serene moment. Trudging back to the tiny village, I sat eating noodles in my room. I was alone that night, and had plenty of pondering ahead of me. I’d been doing some research back in the Nujiang about the intrepid exiles that populated those hills. John Scott, a Yale scholar whose work I cited earlier in this adventure, had long claimed that the mountain peoples of Asia were often wilful exiles of states they disagreed with. Being a subject of a state or empire has long come with burdens: taxes, conscription, and oppressive oversight, often with little reward. In one Scott lecture, he referenced the Great Wall. “The Great Wall”, he said, “was just as much about keeping subjects in as it was keeping about the barbarians out”. 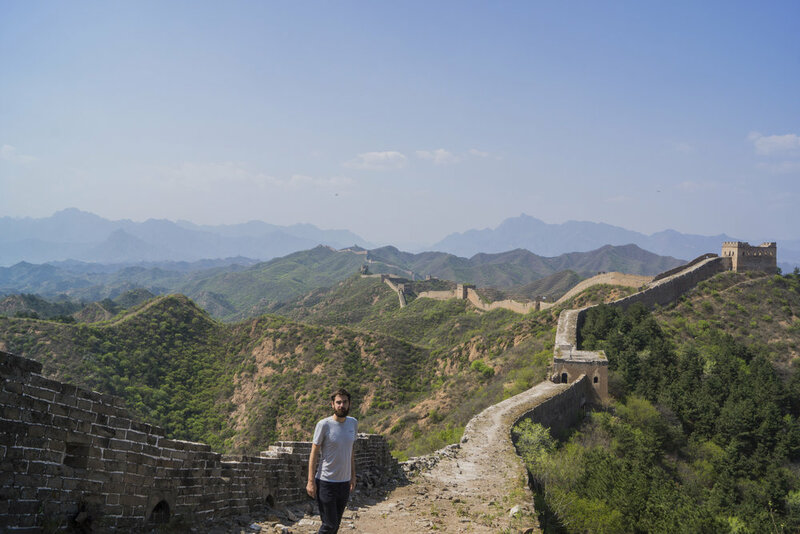 Construction of sections of the wall began as early as 200 BC during the Qin Dynasty. Then, as now, human capital was valuable. Qin Shi Huang, the founder of the Qin Dynasty, was the first emperor of China. He united disparate kingdoms for the first time. Any newly formed state will always have its opponents. Scott’s thesis - that the wall was just as much about keeping tax-paying, army-filling subjects in as it was about keeping aggressors out makes sense. I couldn’t help but see the parallels today. Now - as then - walls are about much more than just keeping the enemy from coming in. That proposed barricade from San Diego to Brownsville is ostensibly designed to stop refugees crossing America's southern border. But it is just as much about placating and neutralising a domestic audience. Such a wall won’t physically stop Americans from fleeing abroad of course, but it strategically validates Americans’ growing belief that the world is a scary place - and that the demagogue who conceived the wall is the only who can protect them from it. In a way, it keeps them in, wedded to false notions about the world and their place in it that they'd be unlikely to ever run from. Just as the Great Wall had two sophisticated purposes, so too does that antiquated presidential decree. On the second day I enjoyed another empty wall. This time, I explored it from 500 ft with my drone. The scale of the wall is immense. It was the best ‘touristy’ thing I’ve probably ever done. I walked miles upon miles before seeing a soul that morning. I braved a camera and filmed and update. And then I left it behind. I began the long and lonely walk back to the highway, where I’d flag down a ride back to my final night in Beijing before starting the journey to Ulaanbaatar.